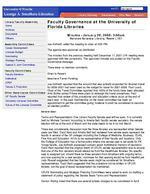 Library Faculty Assembly Home Archives Documents Officers Assembly Committees Career Development Libraries Budget Nominating Strategic Planning Special & Joint Committees Faculty Committees Faculty Senators Sabbatical SPEP Tenure & Promotion Other Governance Committees UF Faculty Senate University Libraries Committee Future of the Libraries Committee myUFL login required Library Catalog Databases Site Map SearchFaculty Governance at the University of Florida LibrariesMinutes January 28, 2008: 3:00pmMarston Science Library, Room L107 Joe Aufmuth called the meeting to order at 3:00 PM. The agenda was approved as distributed. The minutes from the previous meeting held December 17, 2007 LFA meeting were approved with two corrections. The approved minutes are posted on the Faculty Governance webpage. There were no member comments.Chair's ReportSmathers Travel FundingJoe Aufmuth reported that the amount that was actually expended for librarian travel for 2006-2007 had been used as the budget for travel for 2007-2008. Paul Losch, Chair of the Travel Committee reported that 100% of the funds have been allocated. Amy Buhler asked if there were plans to redesign the travel procedures. Paul reported that review of the procedures and allocation criteria occur at the end of each year. In the past, membership on the travel committee has been an appointment to get the committee going; however it could be considered to become an elected position.Senate SeatTerms and Representation: One Library Faculty Senate seat will be open. It is currently held by Michele Tennant. According to Amelia Bell, faculty senate secretary, the senate election will be at the end of March and the slate needs to be in by mid March. There was considerable discussion how the three libraries are represented when Senate seats are filled. Carol Kem and Amelia Bell had reviewed how senate seats represent the faculty in several of the UF colleges including the College of Medicine, Business, CLAS, Fine Arts and Education. All try to be representative of their faculty and locations. Only the College of Education has a formal policy where one senate seat is set aside for PK Yonge faculty. Joe Aufmuth expressed concern about institutional memory of decisions. Carol Kem reported that the original intent of UFLFA senate representation was to ensure that one of the four senators would always be from the Health/Law libraries. No specific seat is assigned but, should there be three senators from Smathers with ongoing terms and one opening for a new senator, nominees for that opening would be from Health/Law. Judy Russell suggested that two Senate seats might be considered for Smathers representatives. Carol Kem suggested that the procedure not be written in UFLFA Bylaws, but the goal of equal representation be maintained. UFLFA Nominating and Strategic Planning Committees were asked to work on drafting a statement of policy regarding the Senate Seats Terms and Representation. Vernon Kisling noted that there are several bylaws changes to be considered in April.